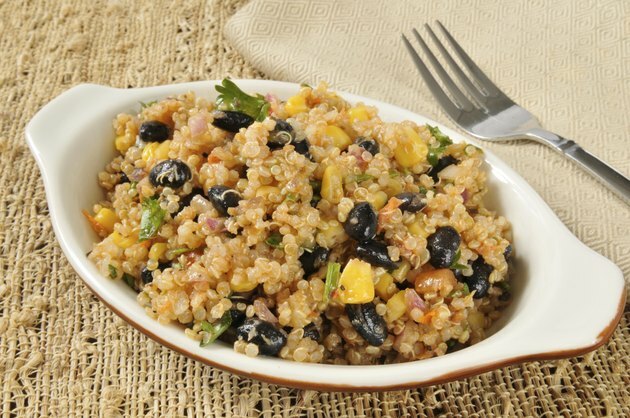 Quinoa is packed with healthy protein, vitamins and minerals, and a batch takes about 15 to 20 minutes to cook. For convenient and fast meals, cook up an extra batch, store it in the refrigerator for as long as four days and reheat it in the microwave as needed. Serve this versatile super-food for breakfast, lunch or dinner. Mix reheated quinoa with agave nectar, nuts and berries as an alternative to oatmeal, or with diced peppers and onions as a savory side dish. Scoop the desired amount of quinoa into a microwave-safe bowl. Stir water into the quinoa to help rehydrate it as it cooks. Add 1 to 3 tablespoons of water for every 1 cup of quinoa. If the quinoa still seems relatively moist, add just 1 tablespoon. Place the microwave-safe bowl into the center of the microwave. Cover the bowl with a paper towel to trap some of the steam while still allowing excess steam to escape. Heat the quinoa in the microwave for about a minute on the high setting. Fluff the quinoa gently with a fork to stir it without breaking down the grains. Return it to the microwave for another one to two minutes, or until heated through. Allow the quinoa to rest for about a minute, then stir it to distribute the heat evenly before serving. If the microwave-safe bowl has a lid, place it loosely over the bowl instead of using a paper towel. Near East: Frequently Asked Questions: What is the best way to store and reheat prepared couscous or rice pilaf?